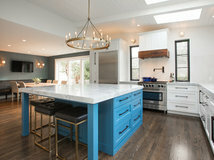 Jessica Sporn, who is an artist, and her husband had been wanting to renovate their drafty, awkwardly configured kitchen for a while, and a water leak on the second floor of their home in Montclair, New Jersey, finally prompted them to do it. 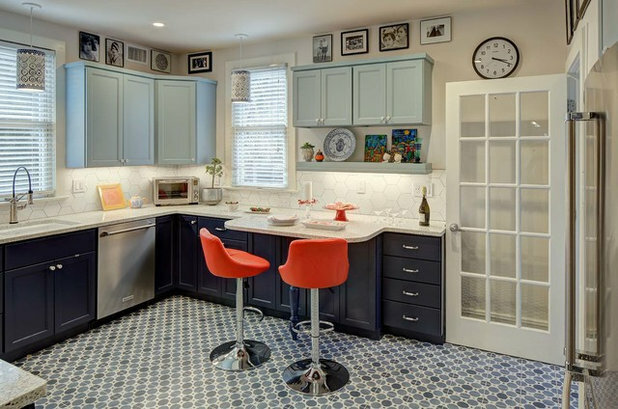 “She has a great eye for color and pattern, which made this a fun collaboration,” says kitchen and bath designer Tracey Stephens, who had worked with Sporn for many years on a handful of other projects. 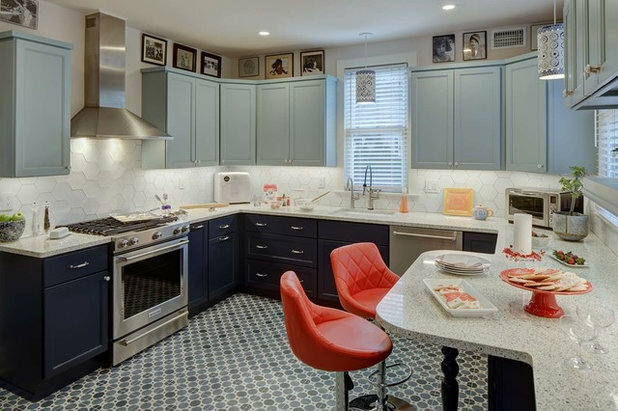 Stephens improved the layout and storage, and amped up the color and pattern, in the kitchen for the family of four. New low-voltage electric floor heating and Roxul insulation in the walls and crawl space help keep the room comfortable and the pipes less prone to freezing. 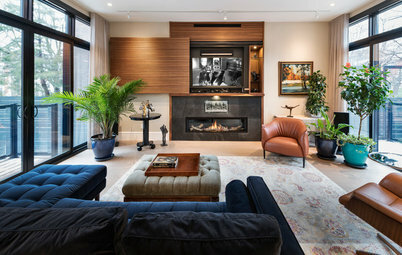 Choosing energy-efficient systems and appliances, as well as eco-friendly materials, was a priority in this project. After: Stephens took out the peninsula, freeing up the flow, and put a breakfast bar opposite the range. 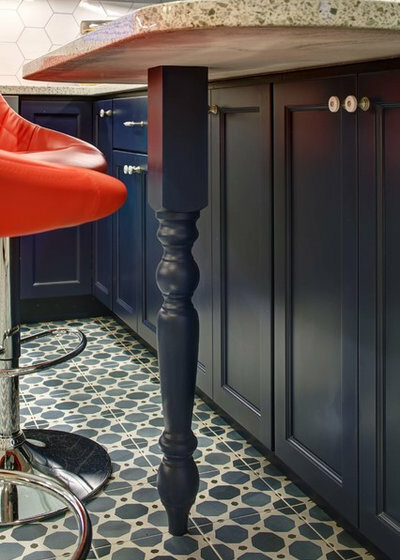 Her color-loving client found the two red counter stools. 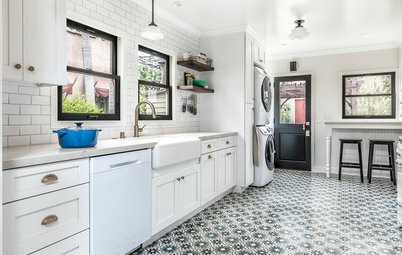 The appliances and sink stayed in about the same places. 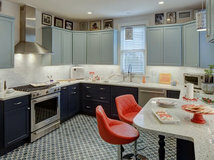 The color scheme began with a porcelain floor tile Stephens had been eager to use ever since spying it at a showroom. She thought it would be the perfect choice for her fearless and artistic client, and she was right. 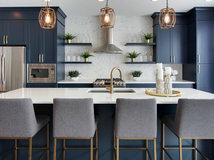 From there, Sporn had trouble deciding if she wanted to pluck a navy or an aqua blue from the floor tile to use on the cabinetry. “I told her she didn’t have to decide; we could do both,” Stephens says. 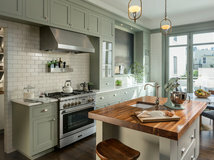 She had the lower cabinets painted in Naval and the upper cabinets painted in Aqua-Sphere, both from Sherwin-Williams. This area illustrates a tricky moment for Stephens. She originally designed a small breakfast bar overhang that didn’t need additional support, but Sporn wanted it to jut out farther, which required this table leg. 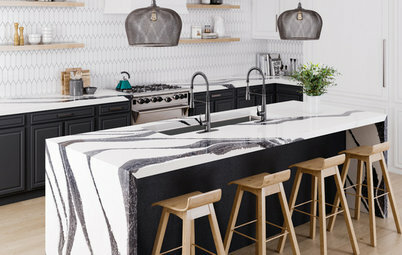 Stephens worked with the countertop installer to make sure that it wasn’t in the way of the diners’ legs or the cabinet doors. Before: One of Sporn’s biggest complaints was feeling trapped when working at the range. She also had to walk around the peninsula to bring food to the dining room, just past the staircase in this photo. In addition to removing the peninsula, Stephens widened the opening to the dining room hallway from 32 inches to 52 inches. 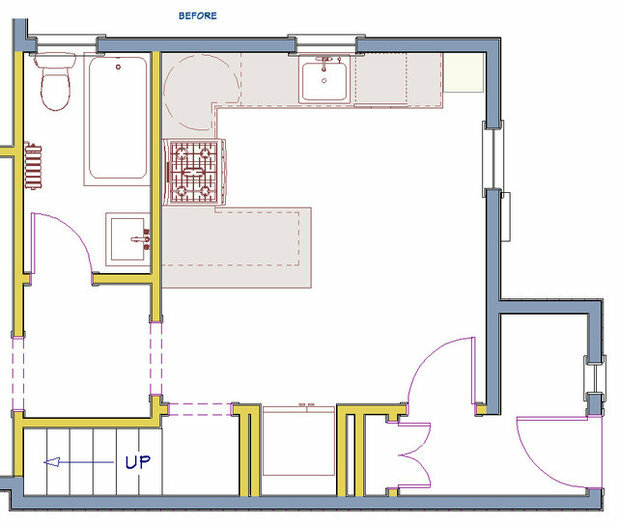 There’s a bathroom behind the range wall, and she extended the kitchen floor tile down the hallway and into that room as part of the project. 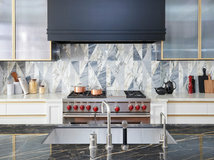 The backsplash is composed of handmade 6-inch hexagonal tiles from Fireclay Tile. 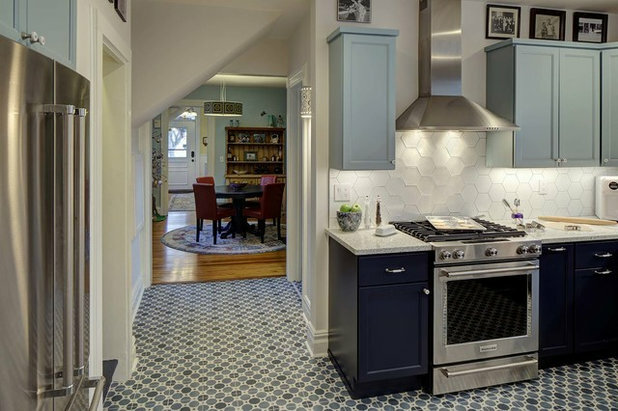 It provides a clean and neutral backdrop for the two-tone cabinets, and it plays off the octagons in the floor tile. 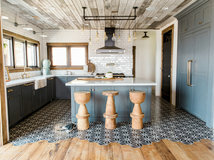 Stephens recommended Fireclay Tile because it is a Certified B Corporation that meets certain social and environmental standards. 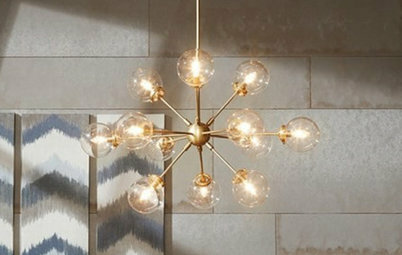 Choosing products like this helped her realize the sustainable goals of this renovation. 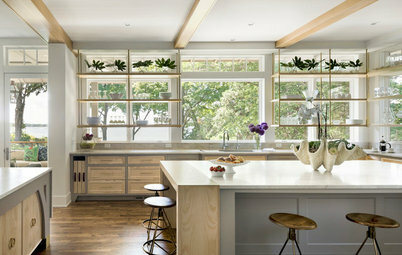 Working with Eastman St. Woodworks, Stephens designed the storage for functionality, efficiency and convenience. She designated this drawer next to the range for herbs and spices. 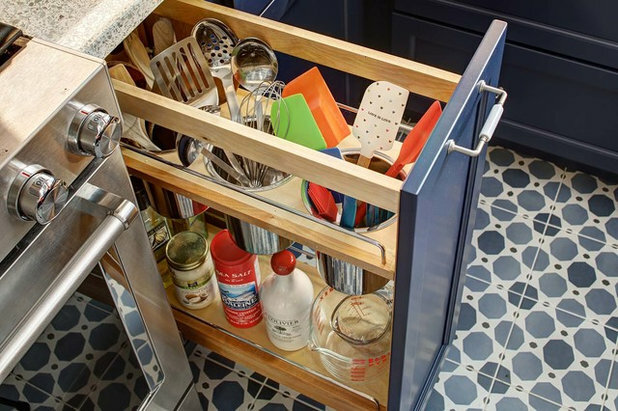 The cabinet beneath it is outfitted for storage containers and their lids. 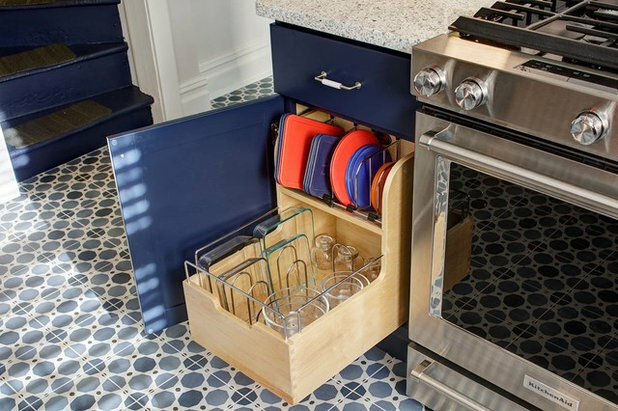 To the right of the stove, this pullout holds cooking utensils, oils and measuring cups. 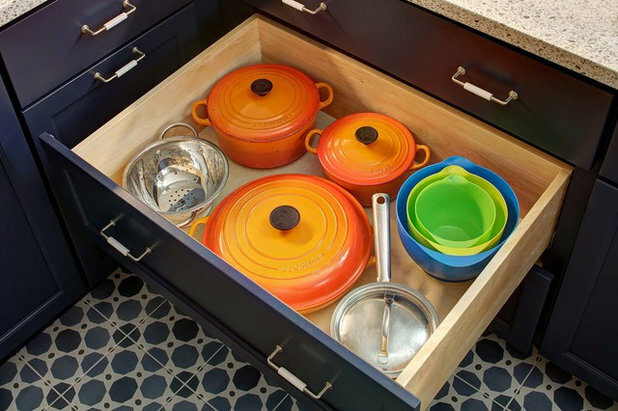 Just past that pullout is a deep drawer for pots and pans. 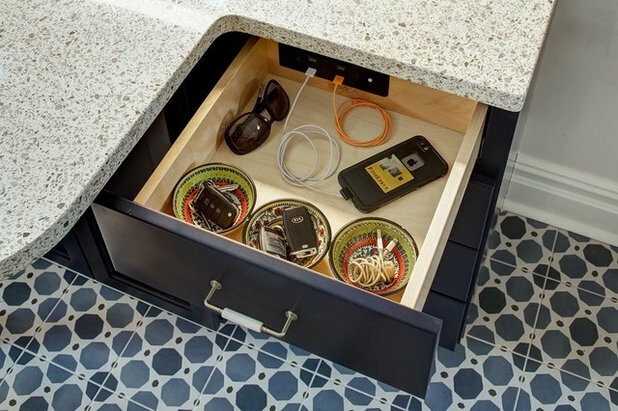 This drawer just off the mudroom entrance provides spots for keys, sunglasses and charging devices. The back of the drawer has an electrical box with outlets, including USB ports. Readers often have questions about the safety of this kind of setup, so let’s get into some detail. This drawer has outlets that are engineered expressly for use in a drawer and meet relevant safety standards. The outlet box inside the drawer is plugged into an outlet installed in the wall behind the cabinet. The drawer is shallower than the other drawers to allow room for this. 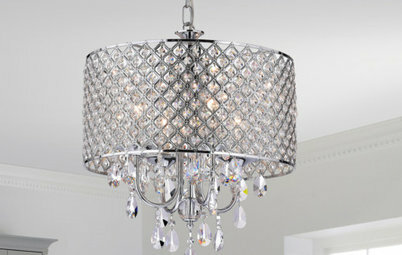 This photo provides a glimpse of Sporn’s artistic talents. The floating shelf holds a platter from a Judaica line she designed, as well as a couple of her paintings. And since Sporn wanted to put her own touch on the lights, Stephens helped her find plain porcelain pendants that she painted herself. 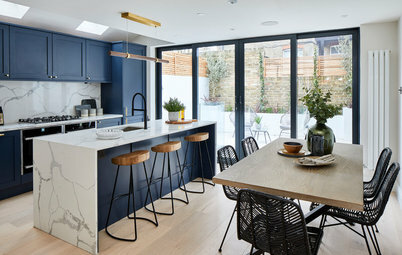 The countertops are a terrazzo that’s made of two-thirds crushed marble and one-third cement. Using a demolition company that recycled the debris. Lumber was shredded to be used for alternative wood fuel, and concrete and ceramics were crushed into paving materials. Using a Greenguard gold-certified paint line. 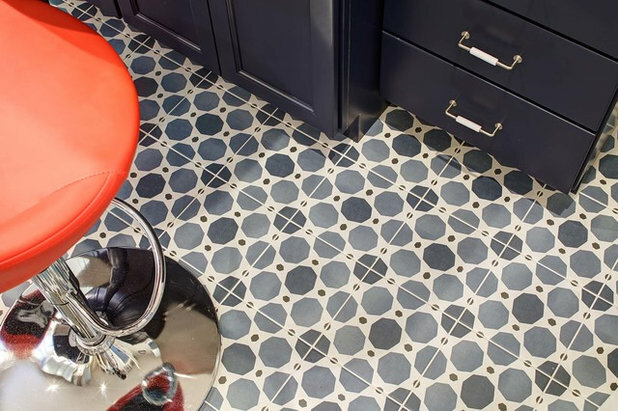 Choosing materials that contain recycled content, such as the porcelain floor tile. Using Roxul insulation, a water-resistant and nonflammable stone wool, in the walls and crawl space. Installing low-voltage electric floor heating. Installing a water filter to reduce the use of plastic water bottles. 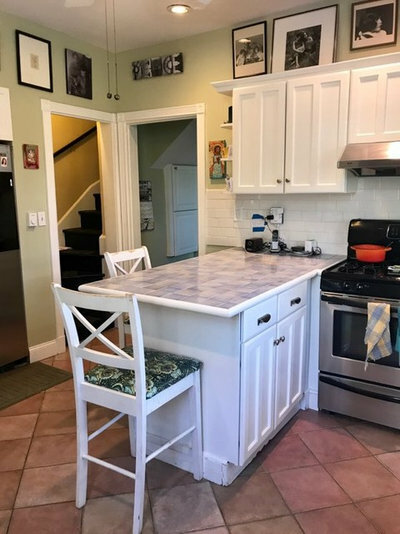 Before: The changes to the floor plan weren’t drastic — the sink, range and fridge stayed in the same or roughly the same spots, which helped keep costs down. After: Getting rid of the peninsula and making the most of the wall on the right had a big effect on how the kitchen functioned. 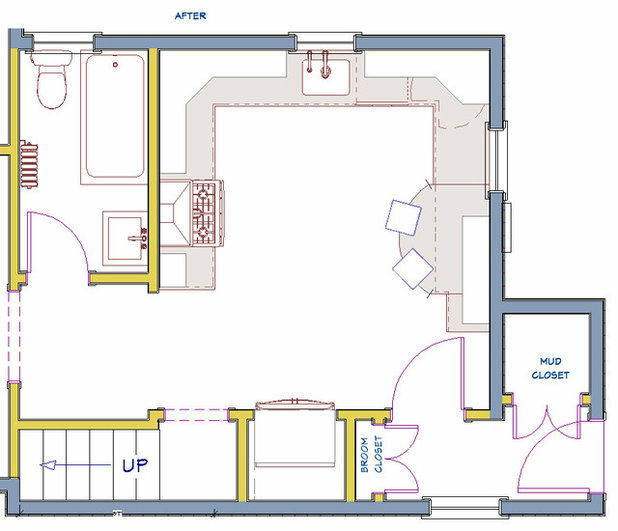 The mudroom entry is in the lower right corner. Stephens carefully planned the countertop to end a quarter-inch from the mudroom door’s swing. A picture is worth a thousand words. 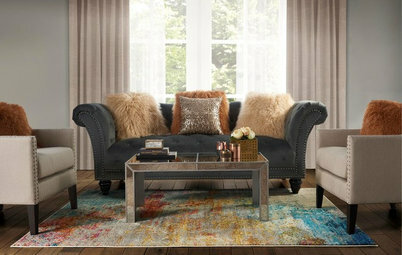 Show your designer your style by sharing photos. 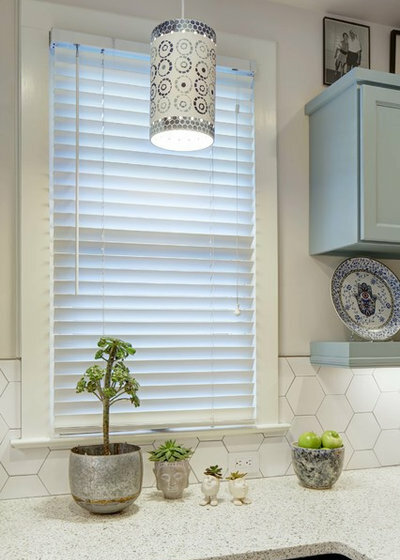 You don’t have to settle for just one cabinet paint color. Go for a two-tone scheme if that’s what you fancy. A small counter bump-out can offer the seating that is more commonly provided by peninsulas and islands. 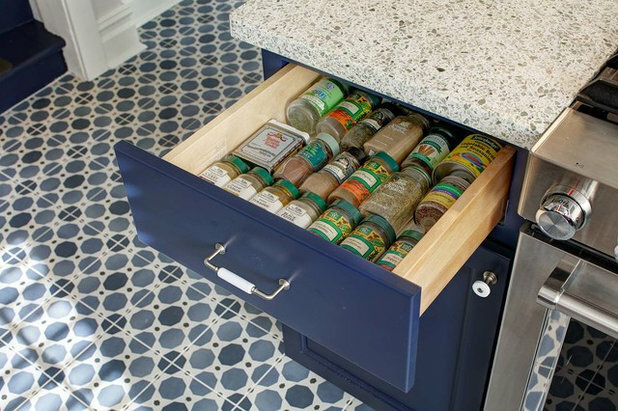 A cabinet that keeps those pesky storage container lids organized can be worth the investment. 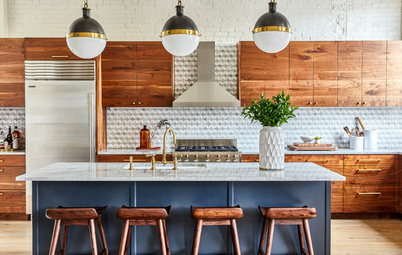 A designer can help you meet your sustainability goals by guiding you toward eco-friendly materials, appliances, systems and practices before construction begins. 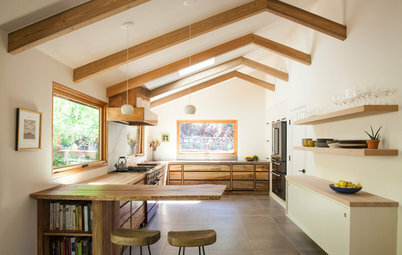 Nice remodel, but I'm curious why steel countertop brackets weren't used in place of the leg for the overhang support at the bar area? hsmeghan - regarding drawers holding heavy weights. We renovated our kitchen 15 years ago and have used a drawer to hold our dishes - 3 pc service for 12 along with miscellaneous bowls. Not sure how much weight is in the drawer but we have never had a problem with it. Hi jennyhg! I assume steel brackets would have had to attach to extra support in the wall to hold that amount of weight (those countertops are HEAVY!). 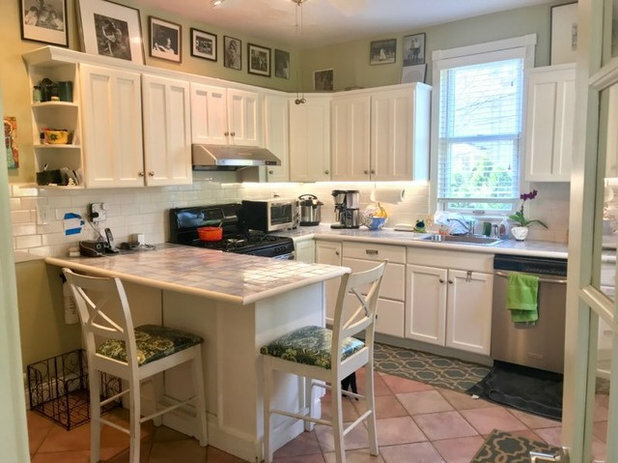 And they would have impeded the cabinets in terms of taking up a little room inside and throwing off the way the doors line up on the outside. 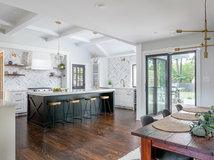 As I recall, Tracey had proposed having the counter bump out less so as not to require the leg, but the homeowners preferred to have some more countertop space there with the leg supporting it.